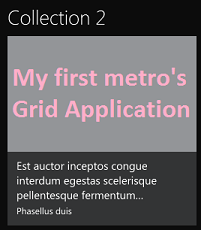 Today I faced a specific need withing a WPF application: I have a well-tested and already in production code which works well for a given user and I need to create an application to execute the same “one-thread/context” code for a lot of users at the same time. The code uses a lot of static fields, properties and can’t be run as it is in different threads. Some days ago when uploading my Windows app to the Store, I’ve got a strange error message : “A previous submission for this app was released with a Windows Phone 8.1 appxbundle. Subsequent submissions must continue to contain a Windows Phone 8.1 appxbundle.”. Here’s how I fixed it ! Do you want a faster File.Exists / FileInfo.Exists / Directory.Exists ? I do ! Sometimes you need to check the existence of a file. Nothing is easier with the .Net framework which provide a property named Exists on FileInfo class. But it can be quite long, especially when the file is on a network drive. If so you’ll have to wait for a time-out to know that the file is not reachable. Mishra Reader, beta 1 is out ! If you are a fan of MetroTwit as I am you’ll be a fan of Mishra Reader. The goal is clearly simple: to become the best Windows Google Reader client. This is done in WPF 4.0 and I am a part of it 🙂 ! The beta 1 is now out and you can get it here. It is made to satisfy you, the users so don’t hesitate to push your ideas/will to us directly from this page. For more information on the new features, please read David’s post on his blog.